Coach Cook's Corner 2004-05. General McLane Lancer Wrestling. 2004-05 WRESTLER of the WEEK! DON OSINSKI - (5-0) McDowell Tournament Champion. 3pins, 1major decision & no points allowed. ASHTON OSTERBERG - (4-0) Redbank Valley Tournament Champion. 3 pins & 1 major decision. fall to McDowell's Nathan Kucnick, with a 2-0 decision. AA #2 state ranked, Trevor Gallo. Alex Allesio at the Grove City dual. placed third. Jamie revesed a quarter final fall with a 15-3 major desicion in the consolation finals. TRAVIS GOSS - (5-1) Travis was promoted to Team Co-Captain. Placed 4th at the Salamanca Tournament. 1 pin & major decision. against Conneaut Lake and Saegertown. BRANDON SARACENO - (1-0) 2-0 win over state ranked Nick Kaiser to cap GM's win vs Ft. LeBoeuf. all won District 10 titles. 2nd at Tool City Tourn. / 2nd at the D10 AAA Tourn. 3rd at the McDowell Tourn. Big Wins Over: Mercer: 52-15, Grove City: 43-24 & Ft LeBoeuf: 37-21. Finished 13th in the state of PA. for "Team Falls" with 158! 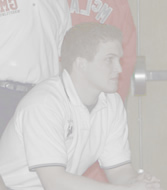 Ryan Dunlap, Gannon University @ 184 lbs. Ryan finished this season with a 9-19 record, but placed in the top four at 3 different tournamnets. Ryan also scored a fall for the Golden Knights. Hayden Harrison, Edinboro University-157 lbs. 14-6 with 5 falls, 3 majors, 5th @ U Buff Open 1st at Jamestown CC Open and 5th at the Edinboro Open. **Hayden Harrison won the Jamestown Open Tournament in dominating fashion. He went 4-0 with 4 falls. 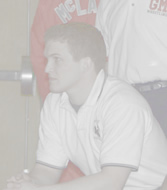 Hayden Harrison went 6-2 and placed 5th at the Edinboro Open (2-19-05). Hayden also owns 2 wins over 2X PA state champion, Andy Rendos of Brockway. 24-17 record. He was an NCAA Division II qualifier. Hudson also had 61 takedowns, 3 pins and 59 team points! An impressive season for a true freshman. He finished in 7th place at Mid West Classic @ Unv of Indianapolis. 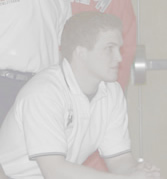 Hudson started for most of the year and had wins over several nationally ranked wrestlers. Hudson lost a 3-1 OT desicion to Luke Main of West Liberty State the #2 ranked 157 lber in Div II. The Lancer Wrestlers finished 13th in the state for "Team Falls" with 158. Only 12 high school wrestling teams in Pennsylvania had more!!!! Let's go guys. Lift and wrestle this Summer. Become a stronger and more skilled wrestler! Congratulations to the newest Members to 2005 PWCA Academic All-State Team !